Wilmington’s Southern-fried Hawaiian music act Da Howlies celebrates fifteen years playing together this year and for a long time they maintained a policy of taking winter off. Founder Zach Hanner says it helped the band’s longevity but in the last few years things have changed. Members of the Playboys – upright bass player Jones Smith, steel guitar player Hank Blanton, and occasionally drummer Jimmy Kaylis, will be playing alongside Hanner and longtime Howlie Greg McLohan on harmonica for a Holiday Luau show at UNCW’s Kenan Auditorium for the final show in their Rush Hour Concert Series. Da Howlies have been performing this version of the band for the last year, playing shows more than just during the warmer months. They have plans to continue through the winter and Hanner enjoys the shared rapport, citing the new guys’ excitement to play shows as much as he does as a large factor. The band’s roots reach back to the 90’s and Hanner living in New York City across the street from Rodeo Bar (where Loose Jets and Brickbat musician James Sardonne once worked). The venue was a honky-tonk in the middle of the city and Hanner became a fan of frequent act The Moonlighters. Comprised of former punk musicians who got into jazz, it was led by two female singers that played ukulele and guitar. Over a short period of time Hanner wrote songs based on the Moonlighters style and then paired up with Bill Ladd (Johnny Quest) and put together a band. They learned Hawaiian songs and western swing covers of Hawaiian songs, like “Little Grass Shack” and “Hawaiian War Chant,” and did so “from this base of southern sounding stuff.” Inspired by Southern Culture on the Skids’ way of incorporating different styles, they injected material with country and bluegrass music which also led to playing Da Howlies-style covers of classic songs, old (Johnny Cash) and new (Pixies). Fifteen years, did you think the band would be still here? Was it a one-off at the time? Yeah, I think one of the things that led to our longevity, especially in our early years, is that we took the winter off. The rule was when it was time to wear flip flops and shorts again it was time to start playing music again. That was good in terms of the early years and certainly we had some people move on from the band. Now we’re in this wonderful partnership with The Phantom Playboys. Their bass player Jones Smith is our bass player. Hank Blanton lead guitarist is our steel guitarist. Every once in a while Jimmy Kaylis will sit in with us. When we have drums it sounds amazing. Leaves me and John McIntyre as out original members. When The Phantom Playboys have a gig John and I can have a show with Greg McLohan, a longtime Howlies contributor, he plays blue harmonica so we do a guitar ukulele harmonica, Taj Mahal kind of thing. So when The Phantom Playboys play Holwies can show up in a different iteration. To some degree I think. Jones is a different player than Seth Moody, who we had before. The thing I like about both those guys, they’re both excited about playing, as am I. I love any opportunity to pay music. Hank has only been playing steel guitar around a year. Man, has he evolved as a player. I’ve been really impressed because it’s to me clear he’s putting in the hours rehearsing. It’s been nice to see that evolution. We’ve been playing this version of the band for the last year. It’s a good vibe. Those guys bring out a fun crowd of people as well as our traditional Howlies friends. Their crowd comes out to check this other band they’re playing in. How did you come upon southern fried Hawaiian music? I lived in New York City into the 90s and my buddy James Sardonne (Loose Jets, Brickbat) worked at this place Rodeo Bar across from apartment. Rodeo was a honky tonk in the middle of the city. There was a band there called The Moonlighters, former punk musicians who got into jazz, like Squirrel Nut Zippers but they went the ukulele route. They had two female lead singers played ukulele and an upright bass player, steel guitar player, Henry who was in the 90s band Helmet. When I moved back to Wilmington in 2001 I’d been playing guitar a few years. I was really into this band The Moonlighters, so my in-laws got me a really nice Martin ukulele as a present. I began playing it and discovered I enjoyed playing ukulele more than the guitar. In a short period of time I wrote a bunch of songs kind of based on the Moonlighters style. Bill Ladd, who had been our original steel guitar player, he was in Johnny Quest, Joe Lean, and all these amazing Chapel Hill bands scene. He and I one by one added players and as we’re learning all these Hawaiian songs, we’re learning western swing covers of Hawaiian songs. Speedy West and Jimmy Bryant did this box set, one of the old records was old Hawaiian songs, “Little Grass Shack” and “Hawaiian War Chant.” We sort of started from this base of southern sounding stuff. Southern Culture on the Skids has always been one of my favorite bands, I’ve probably seen them more than any other bands ever in terms of numbers. I always loved what they did and wanted to incorporate that, so we started doing bluegrass and country music. Its all the same instruments really, guitar, steel guitar, upright bass, fiddle ukulele standing in for mandolin in that kind of sound. Southern fried music was something came up with, evocative of what we tried to do. Our home gig was the Tiki Bar at Carolina Beach, don’t get better than that place. It all fit together. Are you fan of the music or did it grow out of playing the ukulele? Was that a difficult instrument to learn or was it a first instrument? Absolutely. I went from guitar to ukulele, you had to learn a different set of chord shapes. If you already have an understanding how songs are structured and that sort of thing and you’ve been playing an instrument, especial a stringed instrument for a while, the ukulele is an easy transition. I always try to recommend (the ukulele) who are looking for a first instrument for their kid because the chord transitions are pretty easy, the strings are nylon, they don’t hurt fingers like on a steel string guitar. The neck is small and manageable for small hands and a cheap thing to start with for sixty bucks. Kent at Ukulele Academy has affordable ones. It’s a pretty easy thing to learn the basics on. If I go on a trip anywhere I can pack this small instrument in a carry on bag and it doesn’t stick out of my backpack. An easy, portable thing, it’s almost therapy too. I sit here in my office and four ukuleles on the wall behind me. I can turn around behind me, grab one, and immediately de-stress and relax a little bit. It’s a very relaxing, easy instrument to play. Have you written original holiday tunes, what have you got planned, can you say? We do the “Mele Kalikimaka” song. Several years ago Jimmy Phillips (Rural Swine) and I recorded a Christmas song “Santa is a Hodad” about what a crappy surfer he is. We’ll be working that one up for the show too. 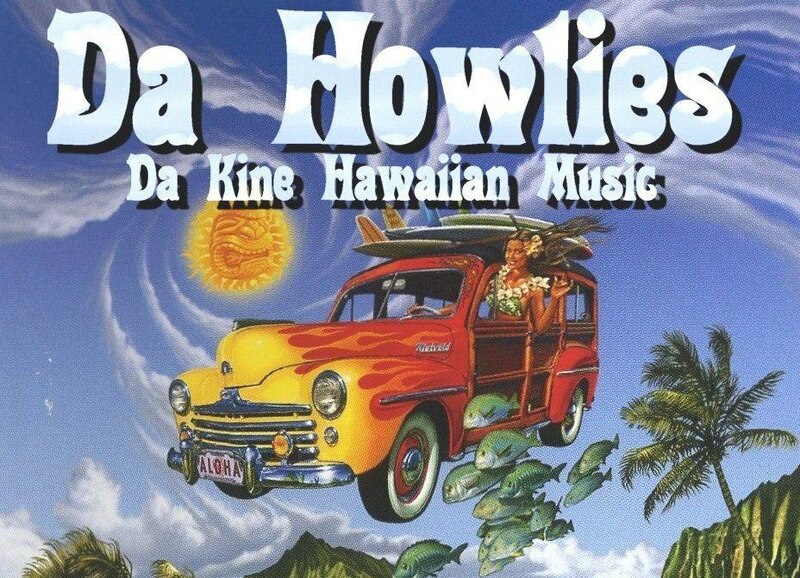 Mostly our original stuff and traditional Hawaiian tunes. About three years Bill Ladd retired form Da Howlies as steel guitar player. Seth Moody, our bass player, moved over playing slide stuff on his hollow body guitar that still sounded like steel guitar stuff. Jones Smith came on to fill in on bass. Jones had been our sub on bass for a few years at that point. We never really played enough shows in a row to gain momentum and get that rapport that you need. With Seth moving to guitar Jones got the songs down. Then Seth moved to Memphis. I guess we didn’t play for eight or nine months after and took hiatus with the intention of coming back. We brought things back with Jones and the deal was to have Greg play leads in the harp. Hank presented himself as a potential steel player.